The best way to tell the difference between a cheap mower and a quality machine is to use it for an hour! If you still feel fresh and relaxed afterwards, chances are you are using a John Deere. All Select Series mowers let you adjust your speed to suit the terrain and mowing conditions. The R54V have a convenient twist knob that makes life easier still. Forget about cords and recoil systems. To start your new John Deere, all you do is turn the key. 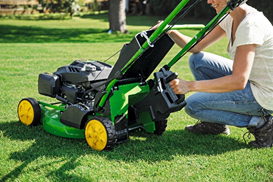 In seconds, you’re ready to mow – safely and conveniently. Whatever the weather, the proven TurboStar System ensures a precision cut and great collection every time. Even in damp conditions, the air flow generated by the blade draws the grass up straight before cutting; it also removes leaves from your lawn. After cutting, the air vacuum blows the clippings into the collection bag smoothly and efficiently. The TurboStar Fill indicator makes life even easier by alerting you in good time when the bag is almost full. *The 15-year warranty covers private, personal residential use. Terms and conditions apply. See your John eere dealer for details. To assist with lifting the lawnmower, a convient carry handle is integrated at the front. Together with a carry handle behind the engine, this makes transportation or particular storage requirements of the lawnmower simple. Easily convert your machine from collection to mulching with the addition of an optional mulching kit. Mulching allows you to cut and process the grass without the need to collect. This is achieved by the clippings being cut and recut before being blown back into the lawn. With a choice of six to nine settings (depending on your model), it’s easy to adjust the cutting height for different seasons and surroundings with a single lever or button. The handlebars can be adjusted to different positions to suit varying sizes of operator and allow comfortable operation. It also allows for them to be folded down to assist with storage or transport of the machine. 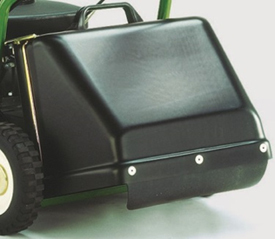 Durable wheels which feature ball bearings ensure smooth operation of the lawnmower. They are also fully enclosed which prevents grass clipping build up. A well balanced lawnmower, with cast aluminium deck, easy handling and Turbostar collection provide a perfect cut each and every time. The READYSTART® engine system allows for simple starting with the recoil rope.No priming, no choke, no problem! A variable speed drive system means the lawnmower is easy to use and no pushing effort is required. A choice of different speed settings allows the operator to select the most comfortable. The handlebar folds down in seconds for easier storage or transport - no tools required. To make starting of the lawnmower even easier, an electric key start feature is incorporated. Simply turn the key and away you go. When mulching, the grass gets cut several times before being pushed onto the turf ground. A blade with stamped-in recessions creates an air flow for the repeating cut to finally blow the grass down on the ground. The small particulars serve as natural fertilizer. Mulching saves the time of emptying a bag. In many areas, the fee for disposal of clippings is obsolete with mulching. 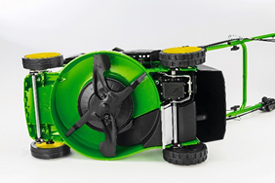 John Deere mulch kits are designed to leave minimal clippings remaining on top of the grass, reducing the amount of clippings sticking to shoes or feet. This helps to keep pathways and the house clean. All 43-cm (16.9-in.) and 47-cm (18.5-in.) consumer mowers can be converted between mulching and collecting within a few seconds. It requires an initial installation of a mulch blade which delivers good bagging results too - so a blade change is not required. All it then takes is replacing the collection bag with the mulch plug. The optional rear discharge chute can be installed on some commercial models. Compared to side discharge mowers, no precaution required to protect running traffic when cutting street-side greens.